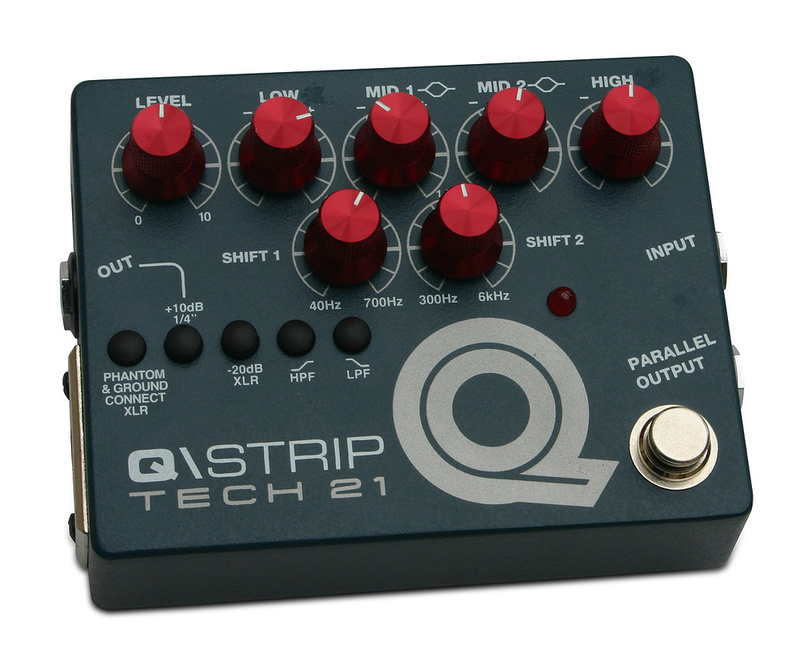 Tech 21 are best known for their analogue guitar products, but in the Q\Strip, it seems they’ve turned their focus to recreating, in pedal format, that part of a vintage console’s signal path that was often pressed into service for the direct recording of both guitars and basses back in the day. A balanced output stage allows the unit to be used as a DI box or as a direct feed to a power amp, and a parallel input jack facilitates signal splitting, allowing you to feed, for example, an amp and a PA system at the same time. Based around MOSFET circuitry, the Q\Strip offers four bands of desk-style equalisation, comprising high- and low-shelf filters plus two sweepable mids (40 to 700 Hz, and 300Hz to 6kHz). The separately switchable high-pass and low-pass filters allow you to constrain the frequency spectrum by trimming the highs and lows — and the low-pass filter can be used in conjunction with the main EQ to approximate a speaker emulation filter. Finished in battleship grey paint and sporting anodised red metal knobs, rather than the usual plastic fare, the Q\Strip’s colour scheme is reminiscent of certain vintage British console’s. The cast metal case has jacks on the sides for the instrument input, the parallel output and the line output, the latter having a 10dB level-lift switch. In order to accommodate both magnetic and piezo pickups, the instrument input has a very high input impedance, but it’s equally happy accepting low-impedance sources. There’s also a balanced XLR output with a switch labelled ‘Phantom and Ground Connect’ as well as a separate 20dB pad switch for that output, which is capable of driving a power amp directly. A footswitch is used to bypass the EQ/gain controls. Power can come from a 9V battery, an external PSU (optional), or phantom power applied to the XLR socket, when the ‘Phantom and Ground Connect’ switch is engaged. Other than the six EQ controls, there’s just a level control, the five button switches already described plus the footswitch, which has a red status LED. Applications for the Q\Strip include using it to ‘push’ a guitar amp, teaming it with a power amp to act as a bass rig, and pre-processing a guitar, bass or keyboard signal prior to recording directly into a DAW. You could also feed it from a mic preamp for vocal or instrument recording. The high-cut filter may be useful for recording or for feeding a PA where you don’t have a dedicated speaker emulator, and conventional drive pedals or other effects can be placed before the Q\Strip in the signal path. 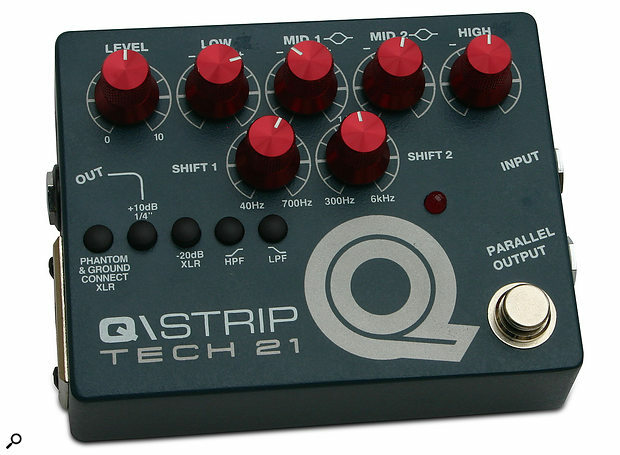 Used to record electric guitar, the Q\Strip delivers very clean and musical results. The EQ works efficiently and smoothly to voice the sound, with plenty of flexibility from those two sweep mids; it holds no surprises, but it’s a musical-sounding EQ nevertheless. For recording bass sounds just add a touch of compression and you’re done. Used before a software amp modeller, the EQ controls can be used to fine-tune the way the amp’s overdrive reacts, and if you prefer to use a conventional analogue pedal to create your overdrive sounds, putting it before the Q\Strip works extremely well. As claimed, the filters and EQ can approximate a miked-speaker kind of sound for live use, but the result lacks the nuances of a convolution-based approach, so for recording ‘dirt pedal’ guitar sounds in particular, I’d be inclined to leave the high-cut filter switched out and instead use something like Audified’s inexpensive MultiCabinet plug-in — if your DAW doesn’t already include something suitable. All in all, then, the Q\Strip provides an effective combination of instrument amp, console-style EQ, DI box and signal splitter. It has a low noise floor, plenty of output level and enough input headroom to handle pedals without hitting the rails. If ‘analogue first’ is your idea of a good time, then the Q\Strip has much to commend it.